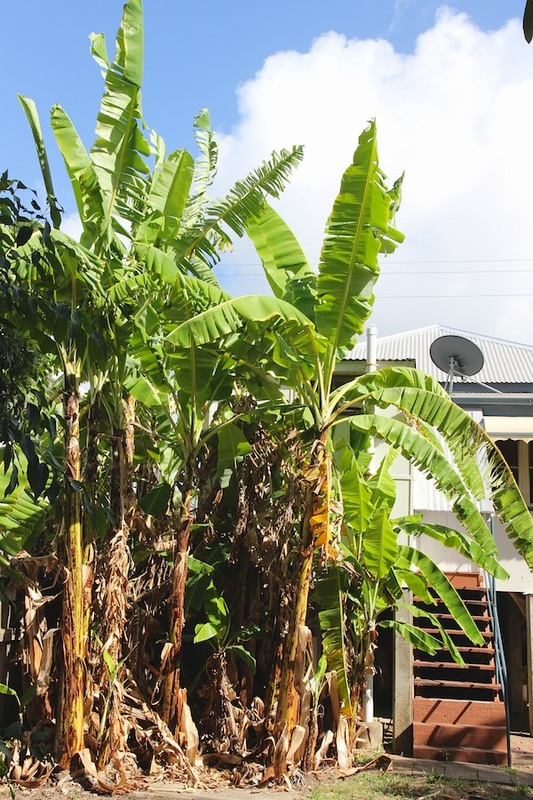 An environmental group I volunteer with has its office in an old (1920s) house whose backyard has always had mango trees (every North Queensland gardener from 1900 until at least 1950 started his garden by saying, “Let’s plant the mango tree here“) and a patch of bananas. They were left alone when the rest of the garden was put into low-maintenance mode (lawn in sunny areas, mulch under the trees) and three weeks ago, prompted by the sight of a bunch ready to pick, I spent half an hour beginning to clean them up, returning home with a small bunch of bananas and a moral obligation to go back and finish the clean-up. When I went back ten days later to do that I found another bunch ripe enough to cut down and brought half of it home, leaving the other half for Centre staff and volunteers. A bunch on the plant. The flower bell is tiny and at the end of a very long stem. 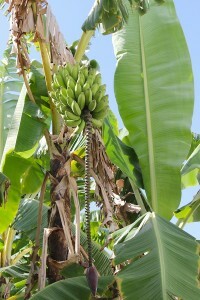 They are good bananas, too, although I’m not yet sure which variety they are. They are neither the (nearly universal) Cavendish nor Ducasse but may be what we call Lady Fingers, although the fruit are even shorter and fatter than most Lady Fingers I have seen. The stems are very tall – many are 4m or more – and the leaves are long (2m) and broad. Whatever they are, I will dig out a couple of suckers once the wet season gets under way and plant them in my own garden. The texture of the fruit is more like the Cavendish than the very smooth, firm Ducasse and when you bake them the difference becomes even greater. I have a recipe for a Banana Slice which comprises a layer of sliced bananas between two layers of an oats-flour-sugar-butter-eggs dough. When it comes out of the oven, slices of Ducasse are cooked and have changed colour but are still intact and firm, while slices of Cavendish, Lady Finger or the current variety have cooked down and blended right into the cake mixture. The same difference is apparent when you try to fry them: Ducasse stays firm and may even become rubbery, while the others soften. I came across a banana wiki and its associated image bank while trying to identify my new bananas. 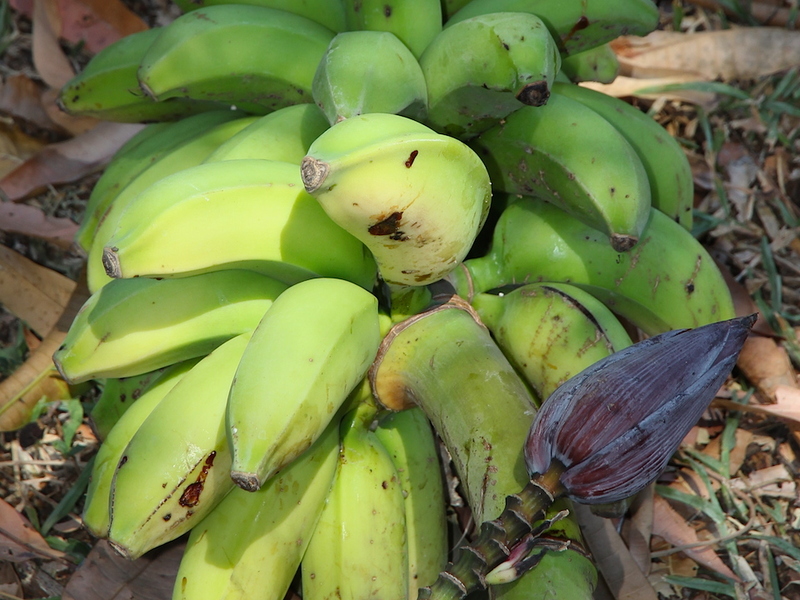 They didn’t help in that enquiry but may be useful to others interested in bananas so here they are: Promusa and Musarama. Great to find a patch of bananas that you can forage from. They look exactly like my Lady fingers (at least I am pretty sure mine are Lady fingers). Small flower bell on long stem, tall tree, shape of banana are all the same. I guess old established patches are unlikely to be an unusual variety, but probably either the common Cavendish or Lady finger. This seems to be an active forum on bananas, and it has a section dedicated to identification. This guy says flowers really help with ID. His pictures are quite spectacular. Interesting information about banana texture after cooking. That recipe sounds nice, I will try it some time. Thanks, Jeff. As you say, Lady Fingers has to be one of the most likely candidates and your information makes me even more inclined to think that that is what these are. Identifying them is on hold at the moment, however, since I’m away from home. When I do get home I will try to remember to post the recipe here, too. It’s a good one and, as you know, making good use of 10 – 20 kg of fruit before it’s over-ripe can be difficult. 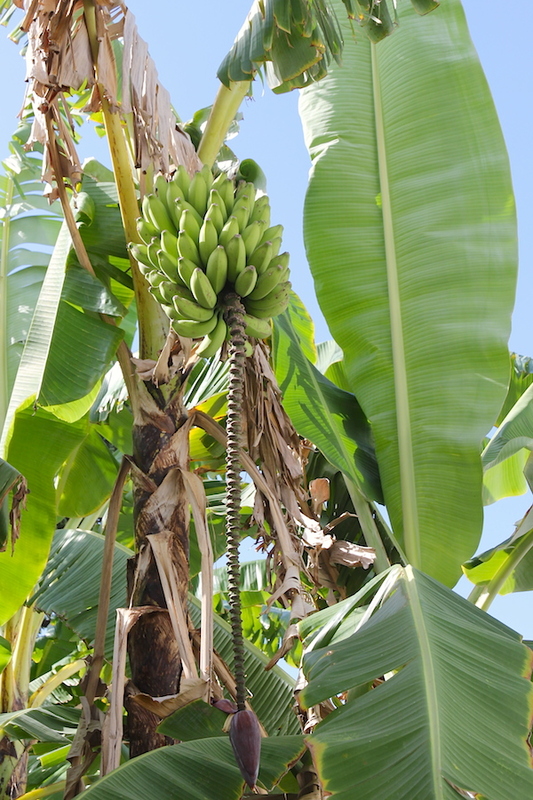 I went down to South Townsville a couple of days ago and came home with a few suckers from this banana patch – really just thinnings, since the patch is so congested after years of neglect. Three of them (all I have room for) are now in my own patch, with another in a pot; it will be a backup if one of the three doesn’t survive, and I’m sure I will find someone to give it to if all grow well. I still believe they are Lady Fingers, mostly because I haven’t yet come across any likely alternatives. I have just repeated the exercise, a year later, coming home with another three suckers. Last year’s lot didn’t do too well: one is healthy but hasn’t yet flowered, two failed to establish, and the one in the pot found another home. I think the main reason my success rate is so low is that some of my thinnings are already a bit spindly and some don’t have much of a root system when I dig them out, but I replant them anyway on the the chance that they just might survive. Losing them is really only losing the ten minutes it took to put them in the ground here, so I’m not too concerned.